Governor Samuel Ortom has demanded the arrest and prosecution of Fulani herdsmen who massacred 24 persons yesterday in an evening attack on Omusu village in Okpokwu local government area of Benue State. He made the call today during an on-the- spot assessment visit to the area to ascertain the level of destruction and provide immediate relief to the displaced. The Governor described the attack as unfortunate saying such barbaric act was unacceptable in the 21st century. 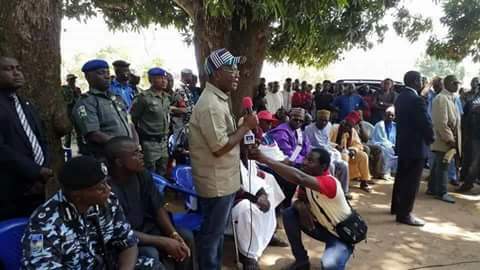 While directing the State Emergency Management Agency to immediately provide relief materials to the displaced persons, Governor Ortom appealed to the community not to embark on reprisal attacks, stressing that security agents were mobilised to forestall further attacks on the communities. The Governor also visited St. Mary’s Hospital, Okpoga where the injured were being treated and proceeded to the General Hospital in the town where dead victims have been deposited. He directed that arrangements be made for mass burial next Friday. Fourteen of the victims are women, two children while the search for more bodies continued at the time of Governor Ortom’s visit. Chairman of Okpokwu local government council, Mr Ogwuche Olofu said the herdsmen had reported an attack on them where some cows and two persons were allegedly missing. According to him, while the allegations were being investigated, they launched an attack yesterday around 4pm, which led to the death of 24, burning of houses with scores injured. One of the community leaders, Mr Itodo Ojobo acknowledged the swift response of security agents to their distress call and appealed for assistance to enable family members bury their dead and take care of those being treated in various hospitals. Governor Ortom also paid a condolence visit on Comrade Abba Moro, former Interior Minister who lost his first wife.